There are many different ways you can make a backpack. This first tutorial will show how to make one messenger bag style. First make the 5 side sheets of the bag. These sizes were generated from the size of all the notebooks I carry with me at school. If you need more or less space in your bag feel free to change the two side pieces and the bottom from 5" to something else. Front and back - 11" by 15" Left and right - 5" by 11" Bottom - 5" by 15"
Tape the 5 pieces together per the sizes. So tape the short edges of the left and right pieces to the short edge of the bottom. 15" sides of the front and back to the long edge on the bottom, and then fold all the sides up and tape them together. If some of the sides are longer than others trim those now and then reinforce the seams by taping the top edge. Height - 16" Bases - 15" and 10"
My clips had two metal tabs that you're supossed to put through the fabric, then put a washer on it, and fold the tabs down. I added 4 layers of tape right where I was attaching the clips for strength and cut two slots in the tape a little smaller than the tabs so it would be nice and tight when I pushed the clips through. Attach the magnetic clips to the two remaining corners on the top flap, then use these to guess where to place their pairs on the front of the back pack. Make it as long as you want it to be plus ~12" on both ends so you can attach it to the backpack. I made mine 52" + 2x12" but I'm also 6'1" so you will probably want it shorter than that. If you want you can wrap the strap in 4" wide duct tape (I got this at the local hardware store) so it doesn't peel and get sticky on the edges. To attach the strap to the backpack use tape and staples and attach the 12" on each end to the the two side pieces of the backpack. Make a 2" wide strip for the strap. RT @NeverPlain_Jane: It's hard when the only person you feel you can relate to taped his backpack straps with Mac 'n Cheese duct tape. @LianaBrooks Homework in folder. Folder and pencil bag in backpack. 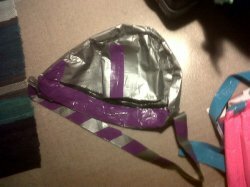 Duct tape backpack to Eldest?